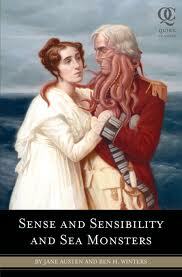 Sense and Sensibility and Sea Monsters, the follow up to the hugely successful Pride and Prejudice and Zombies by Quirk Classics writer Seth Grahame-Smith, was released just a few months after, and soon followed in its footsteps by becoming a New York Times best seller. The idea for this series of books came about when Quirk Books editor Jason Rekulak fell in love with the book title for Pride and Prejudice and Zombies, after comparing a list of classic books with modern concepts of what is popular. It was only natural after the success of one to move onto another. As a lover both of sci-fi and Jane Austen, these books appealled to me from the offset and luckily I was not to be disappointed. Winters seamlessly moves between Austen’s original prose and the mythical world of Pestilant Isle and Sub-Marine Station Beta where life is a constant battle against sea creatures affected by ‘The Alteration’ who are at war with humanity and not only seek to destroy it, but are genetically malformed to be more terrifying than ever. What is notable about this book is that the author manages to maintain all the delightful snobbery we have come to expect from a Jane Austen novel; “But her powers had received no aid from education: She was illiterate of even the most basic knowledge of fish species, navigation, and grades of net meshing; and her deficiency of all mental improvement, her want of information in the most common particulars, could not be concealed from Miss Dashwood.” shows a striking example of this bizarre melding of two worlds fitted together so cleverly by such an eloquent wordsmith. Despite the very obvious differences between the original and the new, we still follow the stories of the Dashwood sisters, and one is still swept along by the nuances of each character, their flaws, their passions, and their miseries. You will find yourself rooted to the spot, unable to stop reading until you have “just finished one more paragraph!” a typical trait of a good book the whole world over. It made me laugh at times, and I was left wanting more at every turn. If I had to find fault, the writing style does fall flat – or rather, diverts into a more modern way of thinking when there are long passages of additional text, and the author seems to forget at times to put a space behind his punctuation marks, but I should rather blame the editor for not proof reading the book as carefully as it deserved than raise a black mark against the author’s name for that small slight. 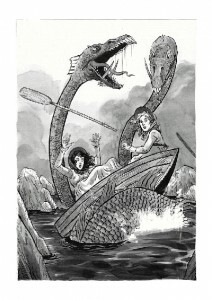 In addition, I don’t ever recall Jane Austen mentioning the knowledge of a “Shish Kebab” in her writing (yes, I quibble over Shish Kebab but have no issue with tentacled gentleman rising from the deep, I’m fickle like that) nevertheless, this clever, witty story was if anything improved by the presence of murderous swordfish and ravaging octopi, and I was held enraptured throughout. Oh, and did I mention there are pirates?